Find a Parish is a service provided by the J.S. Paluch Co., Inc. and is provided free of charge to Catholics everywhere. Here you can find parish contact information, Mass schedules, links to parish bulletins and web sites, sponsors that support Catholic Church bulletins, as well as helpful links to Vatican news, daily Mass readings courtesy of the United States Conference of Catholic Bishops (USCCB), general Catholic news, and the saint of the day. When people take the bulletin…they have our picture and logo! Helping your church, helping your business grow, getting your name into members right here in our community! I can’t think of a better way to advertise. The J.S. Paluch advertising representative, Lisa, did an outstanding job of taking information I provided and creating a wonderful ad. For many years I have patronized the businesses that advertise in the St. Patrick’s Church Bulletin, Huntington NY. 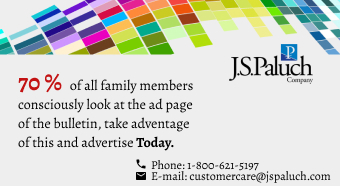 When it came time for me to advertise, I turned to J.S. Paluch.